Those people involved in mining possess courage to go deep and bring up to the world resources that are greatly appreciated. The dangers involved have been recognized and are addressed by Marlink, which has recently strengthened its local presence in Africa to meet the evolving connectivity needs of the mining industry. 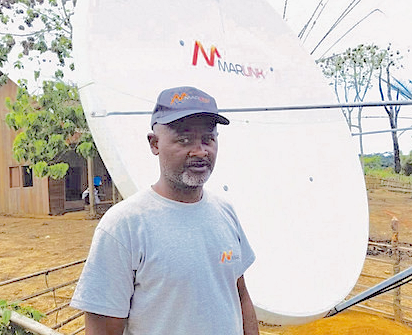 Marlink has rapidly expanded its local team of sales and technical engineers to ensure 24/7 fast field support for new installations, servicing, onsite interventions and technical support for key mining customers in Africa to provide customers throughout the continent with fully managed end-to-end connectivity and digital solutions. With the mining business in Africa rapidly expanding, there is an increased requirement for secure and stable satellite connectivity that facilitates the safe and efficient construction, expansion and management of mines, regardless of the resources being exploited. Due to the lack of terrestrial infrastructure in remote locations, local mining companies rely on satcom-enabled connectivity solutions for remote site automation, corporate network extension and worker welfare, all of which contribute to increased productivity and extended operational lifecycles. Marlink has a long track record of success in providing connectivity solutions across the entire mining operational chain, from exploration to development and production. Currently, Marlink provides and manages secure business communications solutions in Africa for a large number of global mining companies, interconnecting exploration and productions sites, as well as local offices, to first world head offices, through a mix of fiber, wireless and satellite based solutions, ensuring that its clients benefit from the most efficient technologies available. With the expanded Marlink team established in various countries in Africa, mining companies can now count on first-hand knowledge and the highest levels of reliability, network security and scalability to support business communications, operations and worker welfare in harsh operating environments. Catherine Mauvais, Sales Director Africa, Marlink stated that Africa has an exceptional potential growth for companies like Marlink and having first-party presence in countries such as Angola, Burkina Faso, Gabon, Liberia and South Africa, and long-term partners in the Democratic Republic of Congo and Ivory Coast enables them to provide operational services locally and within short timeframes. They are keen to continuously expand their local presence to provide customers with fully managed connectivity solutions for all phases of their mining operations. Operating in Africa for decades, Marlink works with clients in diverse industries. For mining customers, Marlink designs and operates turnkey, fully managed hybrid connectivity solutions, integrating fiber and VSAT connectivity for Internet access, email and data transmission, while securely connecting mines locally and to their international headquarters. Marlink also offers a range of value-added services to enhance business efficiency including satellite Bandwidth-on-Demand for temporary needs and back-up, Voice over IP; network security, management tools; last-mile terrestrial and wireless solutions to extend connectivity to mine contractors, camps and offices, and pay-as-you-use welfare services for mine employees. For customers scouting new mining projects, the company provides flexible, lightweight L-band services such as Inmarsat BGAN, as well as portable quick-deploy VSAT systems delivering high-quality and cost-effective connectivity for temporary communications.